Every day there’s news of another major cyber breach. Welcome to the age of the continuous compromise. This is the new normal and you need to get used to it. Yahoo, Target, Sony, RSA, Ebay, Anthem, US Military, Heartland, Dropbox, JP Morgan Chase, Home Depot, Linkedin, Adobe, the NSA, and thousands of others. They spent tens of millions of dollars on their cyber security programs. They had armies of experts, amazing SOCs, next generation sandboxes, firewalls, SIEMs, EDRs —you name it, they had it. But when it mattered . . . They. Just. Didn’t. Know. They were breached. Badly. All of them. 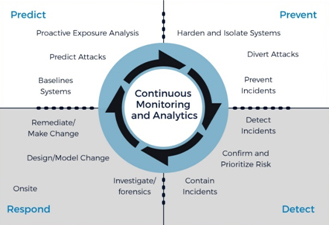 The truth is that improved prevention, detection, response and prediction capabilities are all needed to deal with all types of attacks, "advanced" or not. And these should never be viewed as siloed capabilities. If they don’t work intelligently together as an integrated and adaptive system, complete protection from advanced threats will remain elusive.